Not everyone wants to spend $100 or more on a pair of Bluetooth earphones. Perhaps you’d rather save that cash for dinner with your partner, or maybe you’re hard on your belongings and easily lose track of them. For that matter, you may not see the point in spending so much coin for an accessory that you’ll maybe use, at best, for a few hours a week at the gym. For you, “good enough” may be good enough. If any of this sounds familiar, Aukey’s EP-B40 Latitude Wireless Earbuds might be a good fit. While they suffer from a number of irritating shortcomings, they sound far better than a pair of $28 earphones have any right to. 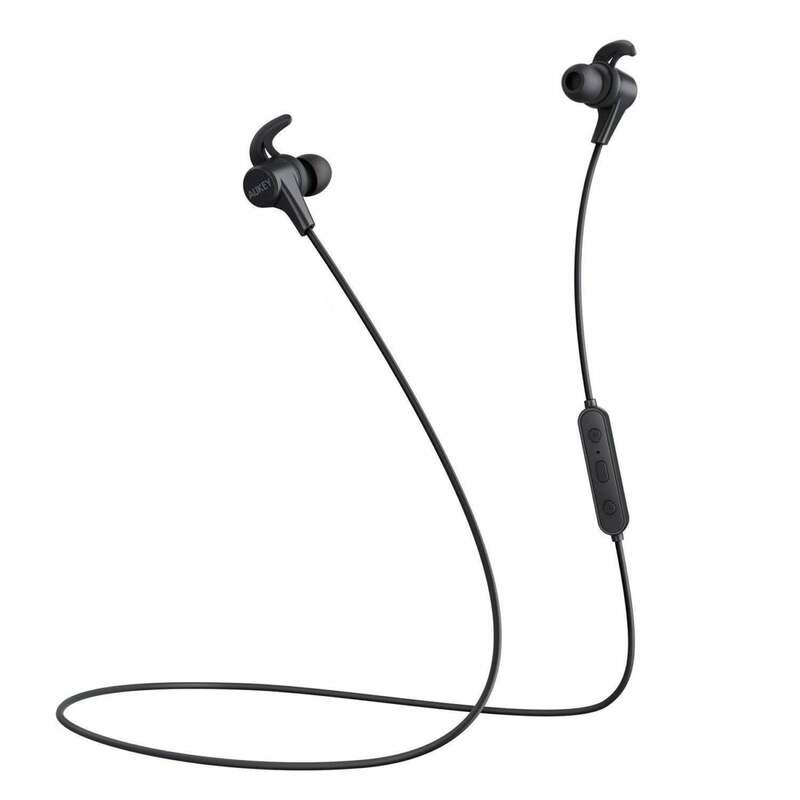 Bluetooth earphones sold for under $60 often look cheap because, well, they are cheap. This isn’t the case with the Aukey EP-B40s. Almost entirely matte black in color besides Aukey’s subtle white branding on each earbud’s shell, the EP-B40s look impressive. 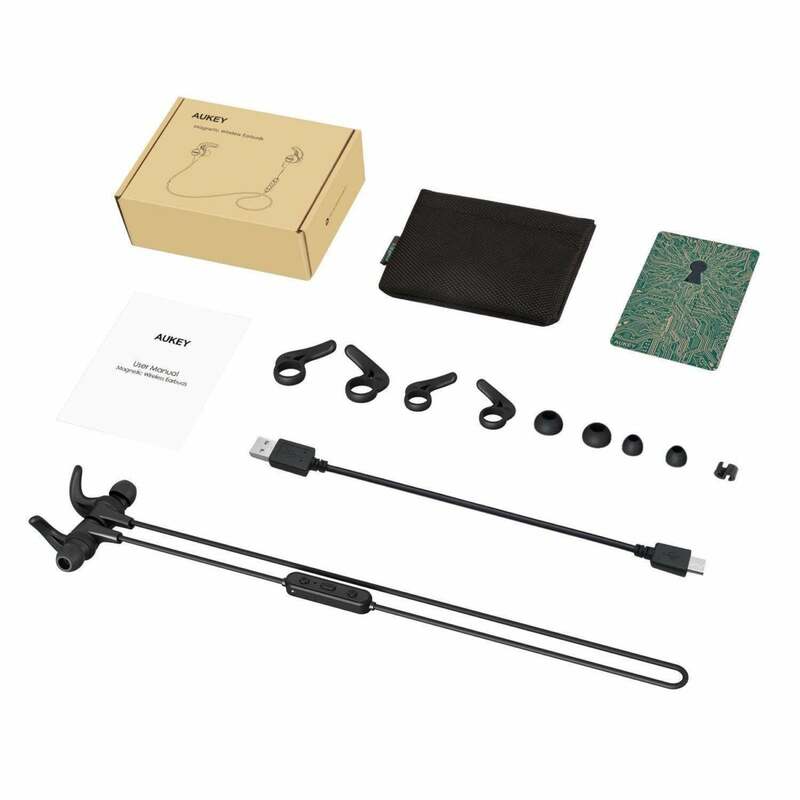 A closer examination, though, reveals that Aukey made the earphone caps, stems, and inline controls with lower quality plastics than you’ll find in a unit from Bose or Jaybird. But the construction is good: I was unable to detect any noticeable seams or irregularities. 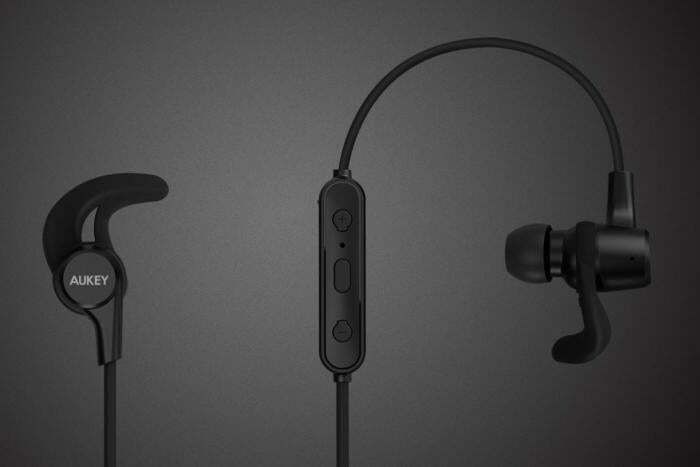 Should your experience differ, Aukey covers the earphones with a two-year warranty. What’s more, the lightweight plastic used in the construction of the EP-B40s makes them more comfortable than many other earphones I’ve tested in the past. That said, as no two pairs of ears are alike, your mileage may vary. Out of the box, the EP-B40s come equipped with a pair of silicone fins and a medium set of silicone ear caps. If you need a different fit, they also come with a pair of small and large silicone ear tips and two additional sets of silicone fins. I found that the default size of tips and fins kept the earbuds snugly in my head while I walked, jogged, or nodded along to The Clash. The EP-B40s come with a number of silicone fins and ear tips that ensure a secure, comfortable fit. Unfortunately, the silicone tips’ passive noise cancellation leaves much to be desired, as none of the three included tips could completely block external sounds while listening to music unless I cranked up the volume to maximum. While this might be good for situational awareness in the gym or for street jogging, you’ll be disappointed if you want to block out the din of a subway car on your morning commute. The cable running between the EP-B40s’ earbuds is short enough that I never managed to snag them on anything during testing. I wish more earphone manufacturers would keep this design consideration in mind. That said, the soft rubber exterior of the cables often caught on my skin: Whenever I turned my head, I could feel the cables moving with me across the back of my neck. I had a hard time getting used to this sensation and I haven’t frequently encountered it while testing other Bluetooth earphones. I also found that the thin cable made the earbuds highly prone to microphonics: As I turned my head, I could hear the cable hiss across the surface of my skin. With each step I took, I could hear the sound of the cable bouncing along with me. Normally I would scold a manufacturer for this level of aural irritation, but again, these earphones only cost $28. With a price so low, it’s easy to forgive them. The Aukey EP-B40s are water resistant and look like they should cost quite a bit more. When not in use, these earbuds could easily get tangled in a pocket or in the cloth carrying case that comes with them. However, Aukey did what it could to minimize this issue by baking a magnet into the EP-B40s’ earphone caps. Touch the caps together and the magnet will keep them connected until you’re ready to use them. The magnet also allowed me to go through my day with them riding securely around my neck. It’s a nice feature for anyone who’s prone to losing their earphones. 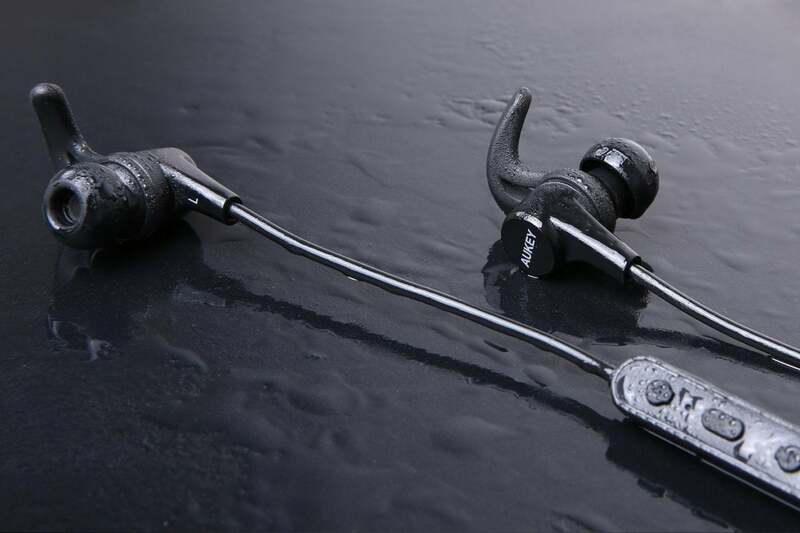 So too, is the fact that the EP-B40s come with a waterproofing rating of IPX4: They’ll stand up to sweat at the gym, but you probably don’t want to be caught wearing them in the rain. So far as connectivity goes, the EP-B40s preform pretty well. They feature Bluetooth 4.0 and, if you’re using an audio source that allows it, they can use aptX technology. I experienced a few minor connectivity stutters while using them on a busy city street, but they proved stable while listening to music at home. It's possible to connect to two audio sources at once with these earphones, but I don’t recommend it. I found that the number of connectivity issues I experienced increased while connected to my iPhone 7 Plus and MacBook Pro at the same time. Aukey says the EP-B40s will run for eight hours off of a single charge, but I found their runtime averaged around six hours after using them for a week. After just 1.5 hours of charging via microUSB, though, these earphones are ready to go. Aukey’s EP-B40s sound far better than other earphones in the same price range that I’ve tested. Where most of the earphones I’ve tested in the EP-B40s’ price range either offered mushy sounding bass or squeaking high-frequency sounds so shrill that I wanted to yank them out of my ears, the EP-B40s sounded fine (but not great). The amount of separation—the degree to which each component of audio can be heard and understood as a separate entity—is middling. When I listened to Kila, a seven-piece band I’ve followed for close to 20 years, many of the nuances of their music that I could pick out while using other earphones simply were not there. They look much more expensive than they actually are. Yet I never thought the listening experience was unpleasant. These earbuds offer decent bass and acceptable mid-frequency sound, although I did notice that high-frequency audio sometimes sounded a bit shrill. But again, they only cost $28. It’s worth mentioning that by quickly pushing the multi-purpose button built into the EP-B40s’ inline controls twice, it’s possible to activate equalizer settings for treble or bass boost. I don't think either improved the sound of the EP-B40s, but it’s there, so you may as well give it a spin. When using the EP-B40s to make audio calls, I found their subpar noise cancellation sometimes made it difficult to understand the person on the other end. Additionally, I was told that the same microphonics that were irritating me made it hard for the other part to hear what I was saying to them while I talked and walked. The EP-B40 Latitude wireless earbuds aren’t the best Bluetooth earphones out there, but for $28, they're exceptional. Given their low price and decent sound, it’s easy to see past their flaws. If you’re on a tight budget, they’re absolutely worth your consideration. This story, "Aukey EP-B40 Latitude wireless earbuds review" was originally published by Macworld.